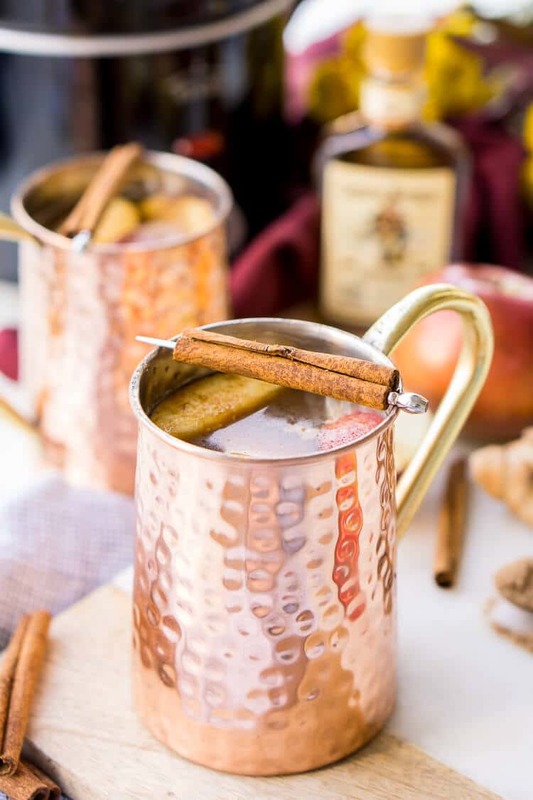 Ginger Rum Apple Cider will make entertaining a breeze this holiday season! 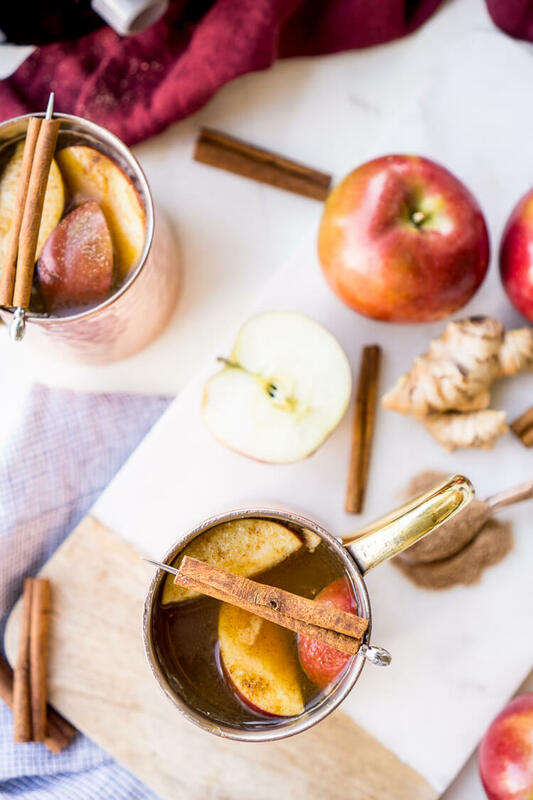 Seasoned with cinnamon, apples, and ginger, this cider can simmer in the crock all night long! 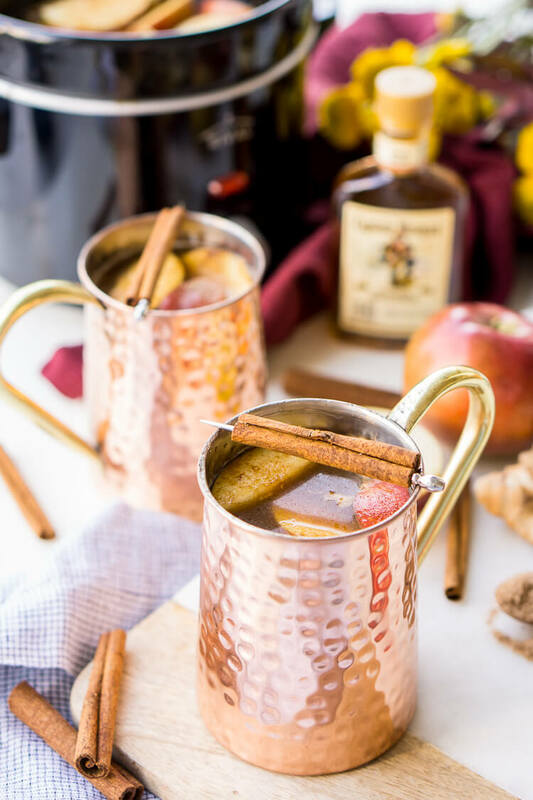 This delicious Ginger Rum Apple Cider is such a cozy hot cocktail for the fall and winter months. Make it for the weekend or large get togethers, keep the spiced rum on the side so guests have a boozy and non-alcoholic option! Three words: Crock Pot (that’s technically two, I know), Apple Cider (that’s another two, I know), and RUM! You know what those three things equal? Fall party perfection! Now, obviously this cider isn’t going to be the only thing at the party, but it’s sure to be a comforting highlight! Thanks to the crock pot, you can mix all the ingredients together ahead of time. Just turn that baby on high and add more cider as needed when guests start gulping it down. What I love most about this Ginger Rum Apple Cider is that the initial batch doesn’t include alcohol, the cider, apples, cinnamon sticks, and ginger simmer on their own, which is great for kids and those who don’t drink. But then, if you want to kick things up a notch, you can simply pour in a little spiced rum for a boozy adult version! Yummmmm! I prefer to use MacIntosh apples in a lot of my fall recipes. Are they my favorite apple? No. But I love how soft they are and how easily they absorb flavor from spices, which is key in a lot of recipes. Fresh slices of ginger give this apple cider a unique note that you don’t tend to find in most traditional ciders. Cinnamon sticks added to the mix with some cinnamon sugar sprinkled on top, plus whatever is in the cider you choose to use give this fall drink a nice spice. 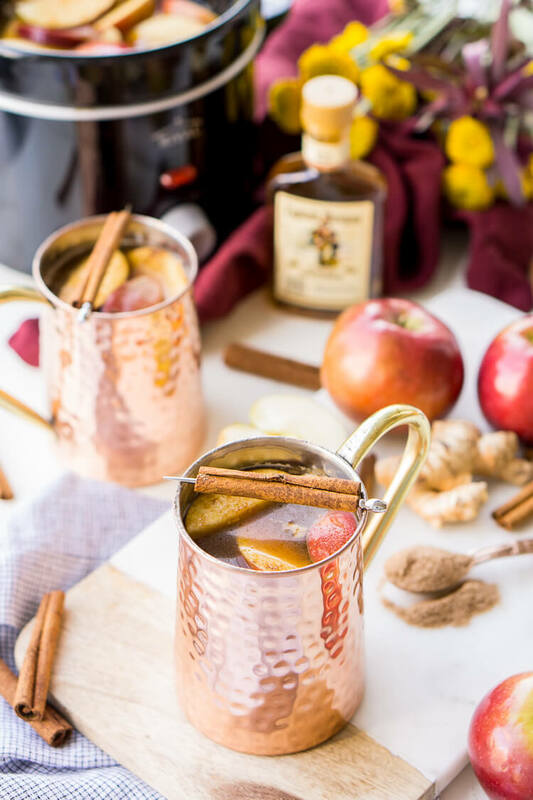 So I hope you’ll be serving this Ginger Rum Apple Cider up all season long and right through the winter months when things get real chilly! 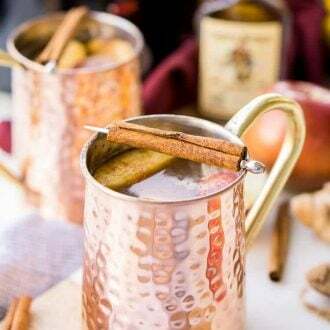 It’s a warm and delightful mug with and without the spiced rum! What are you most looking forward to now that fall is settling in? If you’re still not ready for the hot beverages, try out my Hard Apple Cider Sangria for a refreshing fall drink! You might also enjoy these other seasonal drinks! 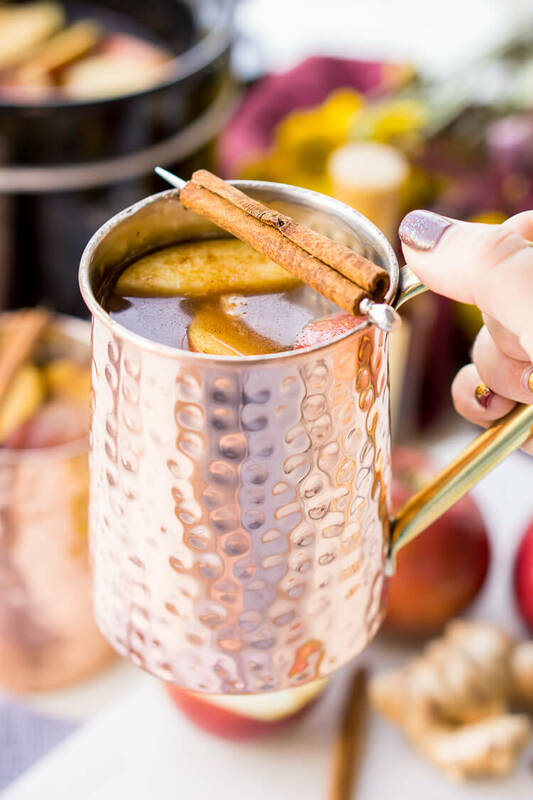 This Ginger Rum Apple Cider will make entertaining a breeze this holiday season! 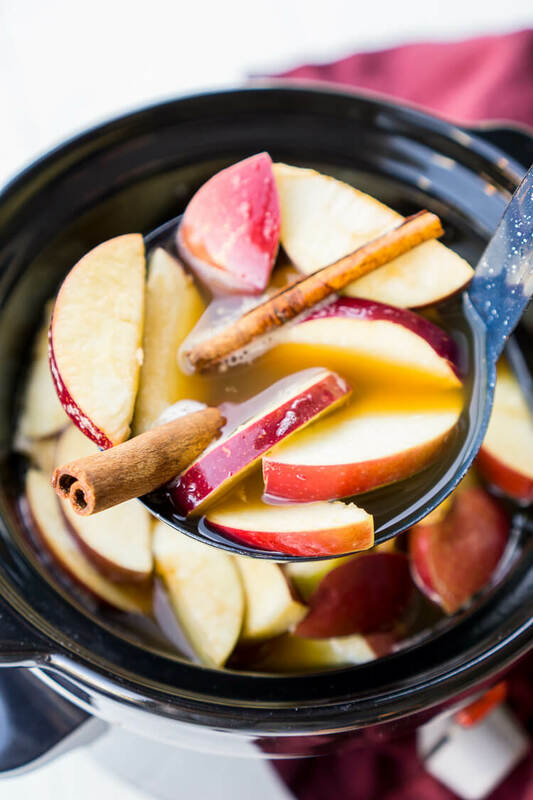 Seasoned with cinnamon, apples, and ginger, this cider can simmer in the crock all night long! 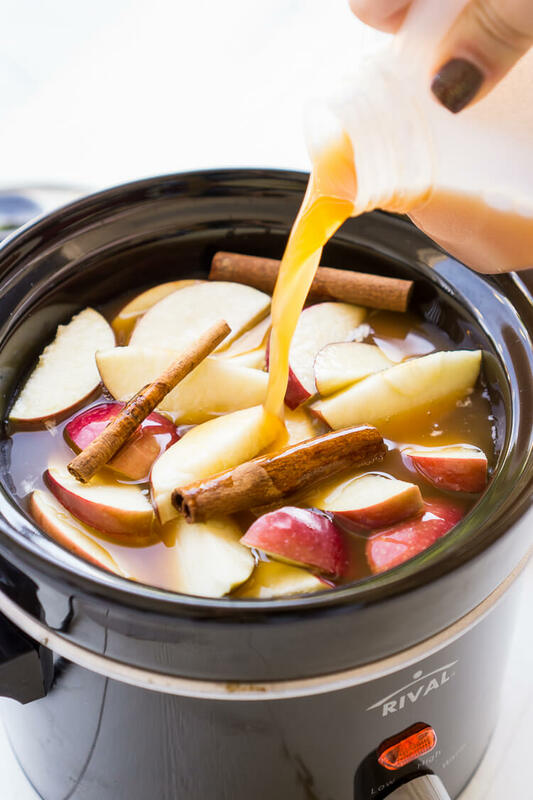 Combine apple cider, sliced ginger, apple slices, cinnamon sticks, and rum in a slow-cooker on High for 1 hour. Reduce to warm heat. You can also heat the mixture on low in a pot until it’s steaming and then transfer it to a slow cooker to keep it warm. Cannot wait to try this for fall. Thinking I might make this Halloween night for friends. Love that it can be for kids and adults.